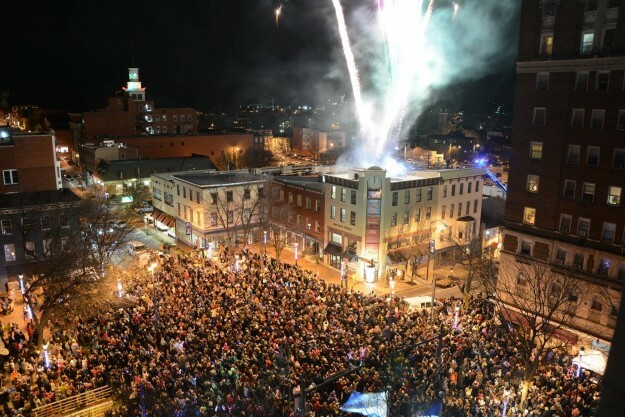 Middletown Valley Bank presents the Krumpe’s Do-nut Drop to kick off the New Year in the square of Downtown Hagerstown, complete with fireworks and live music! 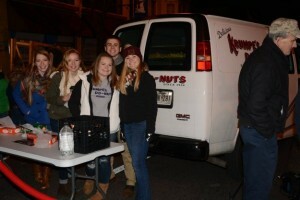 Join Krumpe’s Donuts and HighRock outside on the square in downtown Hagerstown for free AC&T coffee & hot chocolate, free popcorn, free soup and of course, free Krumpe’s Do-nuts to the first 5,000 people! NEW THIS YEAR: Live music by Staff Infection! We hope you’ll make the Donut Drop the first stop for your New Year’s Eve plans. Be sure to stop by downtown restaurants and shops that will be having specials in honor of the big event! If local businesses would like to get involved as vendors or with a sponsorship, contact Melissa Fountain at 301-791-1221, ext 151 or mfountain@highrockstudios.com. 5:00pm – Kid’s Zone (Located on the first block of S. Potomac Street with games, crafts, coloring, balloons and other fun kid’s activities. 5:30pm – Live performances begin by Staff Infection on the square. 6:00pm – Family Festivities: live music, kids activities and fun demonstrations from local businesses, free AC&T hot chocolate & coffee, popcorn, soup and free Krumpe’s Donuts to the first 5,000 people. 6:59pm – Happy New Year’s! The Krumpe’s Do-nut Drop begins! 7:00pm – Fireworks and live music from Staff Infection. Visit us on Facebook @KrumpesDonuts and say you’re “Going” to the Donut Drop event to receive event updates.